Unlike most of Spanx's range, these shaping shorts concentrate on just a small and specific area rather than shaping the whole of your legs. Here, you get all of their attention concentrated on your thighs and bum, but the effects are much more robust. 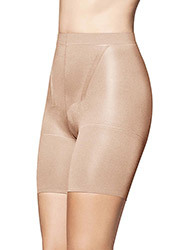 Spanx is going for quality over quantity here and it certainly shows. If you are looking to target these areas first and foremost, there is little else you can pick that will rival the quality and effectiveness of these shaping shorts.